Tonight, the journey begins. It was Toronto’s first game of the Stanley Cup Playoffs for 2019. Their bid for the Cup starts here. Their attempt to shake the Bruins starts here. Their chance at making history… starts here. The game was played in Boston’s home rink, the TD Garden arena. This Game 1 between two division rivals, Original 6 rivals, regular playoff opponent rivals, promises to be a good one. The first period was as exciting a beginning as one could have hoped for. Both teams were playing with incredibly high intensity, as one would expect from a playoff contest. The Leafs were dominating the faceoff circle, an area they’ve struggled in in the past, against Boston in particular. Leading with Bergeron is a luxury not many teams have, for many reasons, but faceoffs is one of them. The Bruins were making a push to run away with this game, but Toronto would have none of it. This great play by Nikita Zaitsev to break up the rush held the Bruins back. The period ended not long after that chance, with the game tied at 1-1. The Bruins finished the powerplay opportunity with a couple good chances, but were unable to capitalize. The period ended with the Maple Leafs leading 3-1, heading into the 3rd period. Here is the updated heat map, from naturalstattrick.com, showing that the Bruins have evened the total chances out, but haven’t gotten into the scoring chance area quite as much as the Leafs. They seem to be getting more of their opportunities in the very high slot, both on the rush and on the cycle, and that’s confirmed here in the heat map. The action slowed down a fair bit in the final frame of the game, as the Leafs just seemed to roll through their lines, and kept very even keeled. There was a shift that stood out in the first half of the third for the Matthews line, as Kapanen and Johnsson were feeding pass after pass after pass after pass into the net front for him, but none of those chances found the net back. Chara, who had been interfering with Toronto players throughout the contest, finally was called for a penalty against Nylander. The Leafs, however, were unable to turn the advantage into an insurance goal. 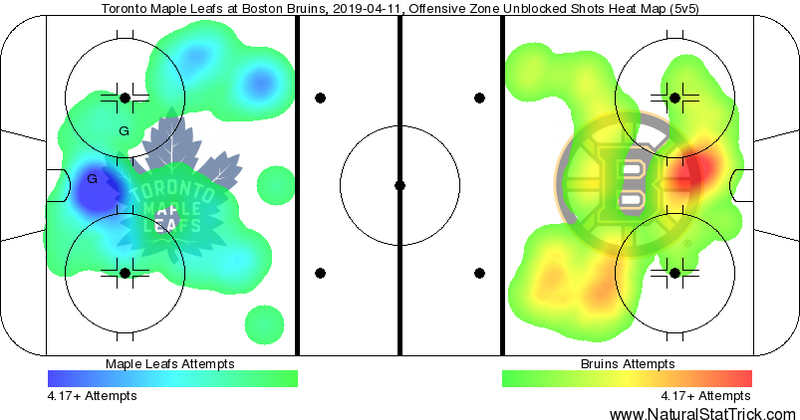 The Bruins pulled their goalie with over 2:30 left in the period, and the Leafs seemed content to just chip it out and let the Bruins come at them. However, luckily, John Tavares was able to win a faceoffs and find the empty net to put the Leafs up 4-1. The Toronto Maple Leafs won this game with merit, unquestionably. They were better in every area of the game. Admittedly, they had some luck, as the Bruins hit a few posts that could have easily put them closer in this game. However, on the whole, the Maple Leafs were the better team. Despite an early advantage in the faceoffs department for Toronto, the Bruins did claw back and make it exactly even. Each team won 50% of the draws tonight. Overall, the whole team was great. Everyone played up to expectations or higher, which is what you need in the playoffs. If anyone slips, it can be in the back of the net and that can be the series before you know it. The next game will be at 8 pm on Saturday night, for Game 2 in Boston. See you there, and GO LEAFS GO. Gotta be Marner. Two huge goals, as he shows up in the playoffs again.